Imagine for a moment that Facebook and Instagram shut their doors and all your social media contacts were gone in an instant. OK, I don’t want to give you a heart attack here, this is NOT very likely, but it could happen. What would you do? How would you continue to communicate with your audience? This is just one reason it is important to have an email list for your business. Having an email list gives you a contact list that is yours. You own that information. What you don’t own are your contacts or content on Facebook or IG. In addition to owning your contacts and content, your email list is the BEST way for your contacts to hear what you’re saying. Even though we all get a TON of email, if you’re providing valuable content on a regular basis to a person’s inbox they are much more likely to see that content than if you’re posting it on Facebook or Instagram. When you post content to Facebook or Instagram (which you should still be doing–even if you have an email list) it only sticks around for a day, or maybe two (if you’re lucky). Having a large following on either social media platform is great, but that doesn’t mean people are seeing what you’re posting. Think about how many groups you’re a part of. How many pages have you liked? How many people do you follow on Instagram? There is just no way you’re seeing all of the content that these folks are putting out. Just the same, your ideal clients are probably missing your content too, and it’s not because they’re not interested. It’s because they are overwhelmed by content on social media. People generally only do business with those that they know, like, and trust. This is true whether you’re a service provider or sell a product. In order for a customer to spend money with you they need to know that you’re a cool person, that you offer value to their lives, and that what you offer is good and something they can rely on. In order for someone to get to know you they’ll likely need more than a few posts on your business page, or a few pictures on Instagram. While these are still important parts of your business, an email list allows for more valuable content to be shared and can be targeted to meet your subscriber’s actual needs and give them information they want to know. Use your social media platforms to host a giveaway. Find something that you can give away that would appeal to your ideal client. Then, make the requirements for entry signing up for your list and tagging three friends who might be interested on the post that you’ve created. People love giveaways (as long as what you’re giving away is actually cool) making this a fun and easy way to get contacts. In order to grow your email list you’re going to need to give something away in exchange for that email. As previously mentioned people get a ton of email, so they will need a reason to sign up to get one more email in their inbox. Make sure this opt-in is something that will actually help your ideal client. It needs to be well thought out and it MUST provide value. When people land on your homepage make sure that your opt-in is very clear and visible without having to scroll anywhere. If you’re blogging and putting out content ask for an email to get the content or ask for it at the end of the content. If people are using what you’re creating they will likely be happy to hear more from you. There are many other ways to build an email list, but these are the three that have worked best for me. Of course, don’t forget my bonus tip: ask your friends and family to sign up for your list and to share your information with their friends as well. Your friends and family will want to support you in your business endeavors, you just need to ask. Let me know how these tips have worked for you by dropping a comment below. And…if you enjoyed this post and want to hear more from me make sure you sign up for my monthly newsletter. 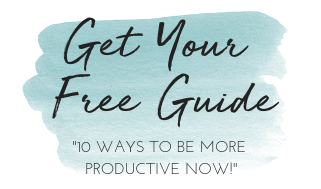 In addition to getting a monthly newsletter filled with valuable content, you’ll also be the first to know about special events and promotions, and you’ll get my FREE guide “10 Ways to Be More Productive Now!” in your inbox immediately just for signing up.